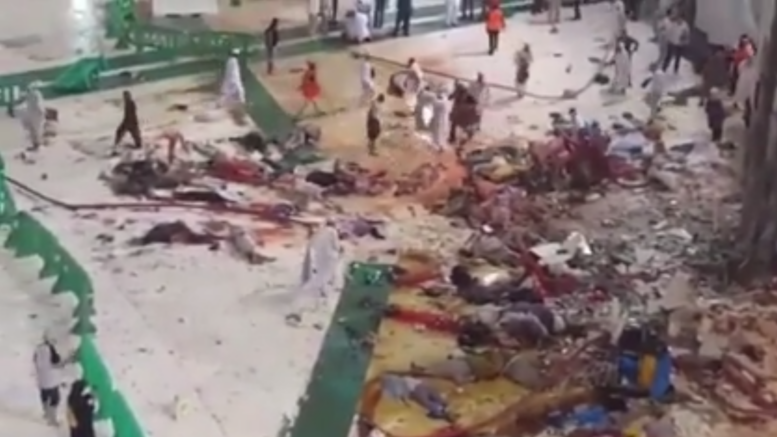 JNN 12 Sept 2015 Riyadh : At least 110 people died and 184 more were injured when a crane collapsed at the Grand Mosque of Mecca ahead of the annual Hajj pilgrimage, the Saudi Interior Ministry said on Friday. Saudi sources said on Friday that strong winds and storm had brought the crane down. At least 238 people have also been injured. The Incident also caused 15 Pakistaani lives , 1 Irani Life and Dozens of Injured . The tragedy comes ahead of the annual Hajj pilgrimage which is due later this month. Millions of Muslims from around the world will converge on the holy city between September 21-26. Photos taken from the scene and posted on social media show bodies lying in blood on the mosque’s floor surrounded by construction rubble and metal parts of the crane. Over 68 emergency and rescue groups are active at the scene of the accident, the Saudi Red Crescent said on Facebook. Forty-nine of the injured have been transferred to hospitals, according to the head manager of the General Department for Hajj and Umrah Khaled al-Habashi. The rest only have minor injuries and are being treated on the scene. The accident happened at a time when hundreds of thousands of Muslim pilgrims are flocking to the holy city to perform the annual Hajj pilgrimage. The governor of the Makkah region, the capital of which is Mecca, Khalid al-Faisal has ordered the launch of an investigation into the causes of the accident. The Muslims around the world has raised serious reservations against such incidents as why the adequate Precautionary measures were not taken before hand , as accident due to weather conditions is alarming , as it is blamed on Rain and Winds ,while the footages from the scence show that the Base of the crane has been uprooted , which is very alarming , Mega Construction on such a level are always done by World renowned reputed and secure companies , who are well equipped and take all the necessary measures beforehand to avoid such disasters , and above all when the construction was carried out at a Place , where thousands of People were Present , who’s lives were at risk , so extra Ordinary measure & equipment should have been used to avoid such fatal accidents . Plus if the risk was calculated beforehand , and if there was even 1% chance of any accident , it should have been at least put on halt and dismantled , in the Peak time of the Pilgrimage , while it should have been carried out in the Low time of the year , when the possibility of accident is minimized , plus if there is even 1% chance then the Ratio of casuality can also be minimized to the Lowest level . An Independent inquiry Commision of consisting of the representative of all the Muslims Nations should be carried out to ascertain the responsibility of the Incident, while in the meantime the Saudi Monarchy should also financially accommodate the heirs of the deceased, as the Monarchy is Sole Beneficiary of the Mega Revenue Generated due to the Pilgrimage of Muslims round the Year. The project to expand the mosque was launched in 2011 by late King Abdullah bin Abdul-Aziz. When in the Name of Numerous Holy and Historical site of the Muslims were raised to ground in the Name of Expansion. It should also be noted that the Europe was all in ruins after the second World War but when the time came for its beautification and expansion , not even historical sites were preserved , but even their Heritage Buildings and Places were preserved till today , as actual , and all the Plans of Beautification and expansion were carried out , keeping the sanctity of their Heritage value and Importance . Earlier in 2015, King Salman bin Abdulaziz added five construction projects as part of the mosque’s expansion aiming to accommodate more than 1.6 million worshippers. The projects cover 1.47 million square meters and include the construction of 78 new gates at ground level, according to the official Saudi Press Agency. The project and is being carried out by the Saudi Binladin Group at an estimated cost of US$26.6 billion, according to local press. The Grand Mosque, surrounds the Kaaba – the most sacred site in Islam. The cuboid structure made of granite located in the mosque’s center is often called the House of Allah. The Kaaba is the place of the Hajj – the Islamic pilgrimage to Mecca, which is one of the five Pillars of Islam. It is mandatory of all Muslims physically and financially capable to carry out the journey at least once in a lifetime. The period of Hajj in Mecca is considered to be one of the largest gatherings of people in the world. There have previously been fatal events during the Hajj period in Mecca, mostly due to the overflow of pilgrims at Islam’s holiest site. Among the latest was a stampede on the last day of the Hajj in 2006, which killed at least 346 people and injured at least 289 more. Other fatal incidents have been due to a bomb explosion, protests, fires, traffic incidents and diseases, including MERS. This entry was posted in Jafria, Middle East and tagged Crane Crash, Hajj, hajj pilgrimage, Holy Pilgrimage, Kabba, Makkah, Mecca, pilgrimage to Mecca, Saudi Interior Ministry, the Hajj. Bookmark the permalink.